This version of pumpkin pie, incorporates winter squash or pumpkin, with gently cooked onion, feta, spearmint and filo, traditional Greek foods. Well the pumpkin is a little unusual but I have frozen winter squash left from last year. There are versions that are sweet as well as savory. I plan to make it again and will add half a cup of golden raisins, and ¼ teaspoon Aleppo pepper not so traditional but I think the flavors will compliment. Aleppo pepper is offered by Nichols and is a Syrian hot sweet paprika that is coarsely ground. I use a lot of this in my cooking, it’s a gentle intensely flavored pepper not widely available in this country. 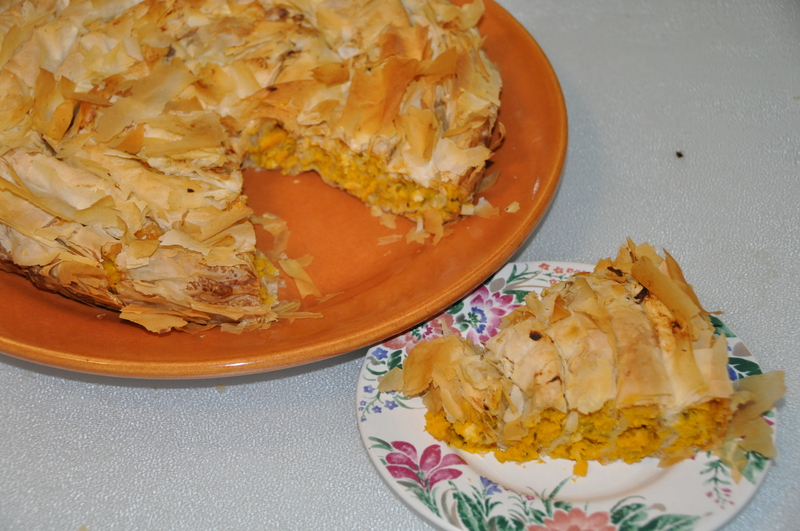 The coiled design is traditional but if you are in a hurry cook it as you would Spanakopita with a few layers of filo, then filling topped with 6-8 sheets of filo. Preparation: I used Sibley Squash which is not as moist as fresh or canned pumpkin. If you are using pumpkin try to pour off any visible liquid and include breadcrumbs which will be unnecessary with many squash. Sauté onions finely chopped (a whirl in the food processor is fine) in olive oil for about 8 minutes at medium heat. Combine pumpkin, cooked onion, cheese, spearmint, crumbs, salt & pepper and taste. Note: eggs are added last so you can safely taste this mixture and check seasoning. Last stir in eggs. Unwrap package of filo, and cover sheets with a tea towel. On a clear work surface take first filo sheet, place it horizontally in front of you and very lightly brush with olive oil. Sheets do not need to be evenly coated. Place a second sheet on top of first and make an even strip of filling 2” above the lower edge and filling to the left and right margins. I used a scant ½ cup for each strip. Fold filo over the filling and roll over lightly brushing each turn with olive oil until you have completely rolled your first coil. Place this along the inside edge of pan. Lay each coil next to the last end and work to center until the pan is filled. Should you have extra filling wrap separately in filo and bake. If it looks as though you’ll run short start using a little less filling as you finish. Mine did come out exactly even with these amounts. Lightly brush top of pie with olive oil and place in preheated 350 degree oven. Cook for one hour and check. If dough is still looking pale continue cooking and check at ten minute intervals until nicely browned. Carefully remove the pan ring, first running a knife blade along edge. Allow to cool for twenty minutes and then transfer to serving plate. Run a spatula all under pie to loosen before transferring. This recipe runs rather long because these steps will be new to most readers. If you have access to sheep milk feta buy it, as it produces a superior result. this pie served with a little salad is an adequate dinner and also a good side dish. This is good hot or cold. Reheat in a warm oven. A microwave does no favor to filo based dishes as they lose the delightful crisp quality and begin to steam. Helen, who does much of our photography planted her fall/winter pantry in early September. It’s 20 feet long and covered in light polyspun row cover. She used 6″ boards. bed is 36″ wide but wanted to make it unattractive to cats. Her materials were sawed off 5/8″ deeply set and 10″ above the ground. wood dowels pounded into the ground and PVC pipe. She was indignant that cats had been pawing through the bed as soon as she prepared the soil. Polyspun was initially effective until a cat or raccoon dive bombed it one night. Critter control that’s not cruel or lethal seems a constant issue for gardeners. Helen solved her problem by covering the polyspun with bird netting just to see if that would deter the cats and that has worked. The beds stand 2′ high. Chicken scratch mix, Italian parsley and single parsley, green wave mustard, five or six different radishes, water cress, mountain cress, and garden cress were all planted in early December. She has done all of this herself and this post will be followed up with pics of her current garden in a few days. Most areas of the US have what I call shoulder seasons when we can grow cool weather crops that actually taste better when grown in lower temperature. The cool temps encourage plants to generate more sugars which act as a natural anti freeze. One of my favorite winter vegetables is nutrient packed kale. This ancient vegetable comes in many forms, curled green Scotch, juicy Red Russian Kale, purple-red Redboor Kale that¹s almost too pretty to eat, upright black Tuscan kale, traditional in Italian soups. Using a large nonstick skillet sauté kale with oil. The wet leaves will quickly cook down as you stir it around, cooking for 7 to 10 minutes. Add a little water to kale if it becomes dry. It should be slightly moist when cooked. Remove from heat and set aside. Preheat oven to 425 degrees. Melt 2 tablespoons butter in a medium saucepan set on low heat. Stir in flour and continue stirring for 2 minutes. Vigorously whisk in the hot broth and cook until well thickened. Stir in pepper, nutmeg and hot pepper sauce and add to kale. Place mixture in a buttered shallow baking dish. Sprinkle bread crumbs over kale and then top with cheese. Bake until mixture is bubbly and lightly browned, 15 to 20 minutes. Serves 6 to 8.